Great character analysis as ever, Brian. My only hesitation about reading this sequence of novels is the amount of time it would take, particularly as I know this would have a huge an impact on my ability to get to various other books I already have on the shelves. Nevertheless, I know they would be hugely rewarding, especially if his short stories are anything to go by. I got this far in the Palliser series and just haven't picked it up again. I think I temporarily burned out on huge Victorian novels. However, maybe it is time to pick up Phineas Redux and move ahead. Great commentary and character analysis as always. I must put this on my list for summer reading when the days are longer. This is my favorite of the Palliser series. Hi Jennifer - As Jacqui and I were saying, these books are big. It is easy to burn out on them. Though Lizzie is pernicious, she is such fun to read about. Thanks James. It can be read as a standalone. As it is fun, it is a good summer book. Hi Fred. I can see why this one would be your favorite. It is so much fun. I haven't read this one (yet) but I have come across a couple of irredeemable characters in Trollope. It's always a bit of a shock when it happens as he's so generous with human nature IMO. Indeed. I think that aside from Lizzie, the closest that Trollope comes to an irredeemable bad person is Mrs. Proudie. This sounds interesting. 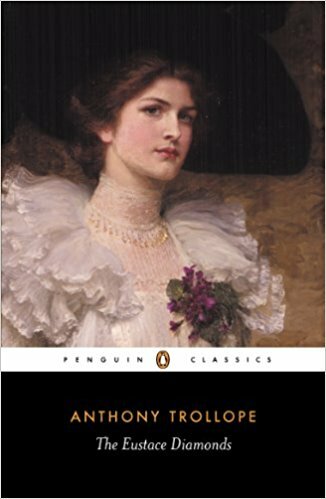 I haven't read anything by Anthony Trollope but it seems like many of the people I know who have read Trollope find his work interesting enough (however long it may be) to read a number of his books. I don't think I'll be reading a book by him anytime soon but I would like to explore his work in the future. Hi Mudpuddle - I think that if you thought that The Chronicles of Barsetshire was just OK, you would feel about the same about this series. I tend to love Trollope's characters. I found that he put people into slots this book, but not so much his other works. You raise an interesting point about Dickens. Folks compare the two, but I think that they are wildly different writers. I will have more on this when I post commentary on Oliver Twist in a few weeks. Hi Kate - The first book in The Chronicles of Barsetshire, The Warden, is relatively short and thus it might not be bad place to start. I would love to know what you thought if you read one of his books. i that Frank here is speaking for writer somehow . i really enjoyed reading this post as great way with expressions always! Lizzie sounds like a fascinating character who uses her charms to the get what she wants. I haven't read any of Anthony Trollope’s work, but I'll keep this book and this series in mind for the future. Excellent commentary, Brian Joseph! I'm glad you found this to be very humorous, although less nuanced than Trollope's other books. Thanks Suko - As I mentioned, this book can be read as as a standalone novel. Hi Baili - Indeed Trollope's negative side comes out here. Though Lizzie can be fun to read about, in the end you are correct, she is sad and pitiable. Thus she fits into the novel's moral framework. This sounds delicious. If I don't want to read the whole series, can I just read this one? I would say so. There are references to the Pallisers and some of the other characters in that series, but it really works well as an independent novel. I read this book a couple of years ago. It was my very first Trollope and I believe you were the one the made me aware of his writings. I really enjoyed it and your analysis is spot on. I find these character studies to be so interesting, especially Lizzie. Your description of her is pretty blunt but very true. I've met these people in my life and I don't understand them at all. Their entire thinking is wrapped around using other people and they are very good at it. I'm particularly vulnerable to people like that, I don't know why. I've had a couple of "friends" take advantage of me. At least I eventually wise up and cut ties. I think most people do, which leaves that person without lasting friendships. I wonder if they see that? Or care? I was particularly surprised at Frank who, as you point out, in many respects is an honorable person. But maybe Trollope (accurately) is showing that no one is above falling, at least a little. I did think it was interesting that Lizzie couldn't hold his attention; that he ultimately became bored with her. Her charm and looks had no sustaining power, not really with anyone. Lastly, Trollope shows how desperate people can be because there was not the equal opportunity to work and make a living. You were at the mercy of your class, station and gender. I'm glad I did not live then. Thanks for a wonderful review Brian! Hope your week is going well. Hi Stephanie- This book works fine as a stand alone. Folks like Lizzie really do a lot of harm. They really seem not to care. I have trouble understanding them too. These books really do show how people could so easily be trapped in the nineteenth century. In Phineas Phin Lady Laura ended up in a position where her husband would have been in complete control of her had she not fled the country. I thought that Frank was more of a typical Trollope character, the kind commonly found in his other books. Very thoughtful analysis, Brian. I concur with Sharon above that I'm glad I wasn't living at that point of time! Australia is an egalitarian society as a whole - I wonder if the USA is similar in that respect? It's something I noticed when we came here from Scotland where class structure was much more defined. We were working class, my dad being a plumber, and we would never have mixed with anyone from a 'professional' class, such as a doctor. I don't know if things have changed very much as I was a child at the time we emmigrated. Every time I read your reviews I want to read the books (not all, most). To return to the book. I find the character of Lizzie pitiful. A woman who uses her charms to the get what she wants. This kind of person who use lies, flattery and sweet words as weapons to better manipulates others. Unfortunately, very ubiquitous in our society. So, Lizzie is a very modern character. That said, a story that promises to be captivating. Very much to my taste. Superb writing style, interesting and funny characters, great dialogue, entertaining...Also, I am a fan of Victorian era. Will add this novel to my TBR list which becomes very long. Hi Brian, I always look forward to your reviews. I must read Trollope. I keep telling myself I will start with the Warden but its time to stop procrastinating My guess is Lizzie probably never loved her husband either. Her focus on getting the diamonds away from his relatives gives me that clue. I appreciate Trollope taking a chance with a character like Lizzie, a main character with no redeeming qualities. Sometimes those can be the most fascinating characters in literature if the writer has the skill to pull it off, which Trollope does. Hi Carol - In my opinion, here in the United States in terms of class and income we are mostly egalitarian. With that there is income segregation and similar issues. I think that we are more like Australia then Scotland. Reading books by writers like Trollope and Jane Austen makes one really aware just how constrained the class thing was. In Trollope's books one can see how the wall between old money and new money were breaking down in his time. It is common theme of his. I think that you would like this book. It is unfortunate that there are people like Lizzie around. I do think that she is an extreme and happily, her kind is not all that common. Indeed, Lizzie married her husband for money. The fact that the main character in this book is so irredeemable was indeed risky and original. Great post Brian, I know you enjoy reading Trollope. Lizzie's character sounds interesting and it seems like Frank can't help himself when it comes to her power over him. It's interesting the way some personality types affect others. Trollope's characters are usually interesting. Lizzie is particularly interesting. A great post, Brian. Lizzie does sound different but fascinating nonetheless. I know I might not read this, as I'm not so keen on huge books, and thus isn't even the first in the series. I'll continue with the Chronicles for now. Though this book can be read out of order, personally, I would also finish the Chronicles of Barsetshire first. Now what happens with the necklace? Does Lizzie get her way? She sounds a bit like Scarlett after Rhett but perhaps worse! Quite a dark character for Trollope. Hi Susan In my answer let me say that there is a spoiler ahead. The necklace is stollen and disappears into the Continent. Neither Lizzie nor the family end up with them. This is deliciously ironic. Well, I have to say it: Lizzie sure sounds like a female version of Trump. Lol. That quote in which she muses on the "beauty" of lies is very telling. I'm sure that "our illustrious President" would fully agree with her. Not publicly, of course, haha! To be quite honest, I don't think I would ever be interested in reading this novel, in spite of its funny elements. I don't think I could stomach Lizzie for ONE minute! Women like her just make me SICK. They're the ones who frequently steal husbands. Lizzie is a lot like Trump! I was thinking that the entire time that I was reading this. I do think that noice folks often do OK. It does happen that people do end up bring attracted to bad people sometimes, but I think it is the exception. One thing that is interesting, the bad folks usually do fool the good ones. But as you mention, that ids not the case for Frank.